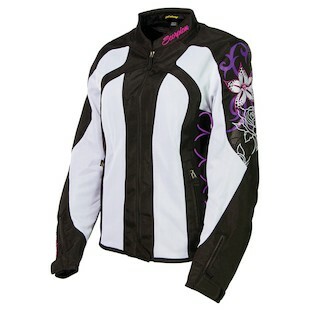 Scorpion Women's Nip Tuck II - Adding Sas-Tec Protection! Summer protection with feminine style, the Scorpion Nip Tuck Jacket has succeeded so far for its optimum combination of ventilation and protection. The Women's Scorpion Nip Tuck II Jacket builds upon this foundation with improved fit, additional styling, and the big notable: Sas-Tec armor! Aside from the Sas-Tec addition, which is a molecular level armor that becomes rigid upon impact to absorb energy and protect the wearer, one of the most obvious changes is the corset-style adjustment along the sides. This gives a substantial range of fit for a variety of frames and shapes, but can be a hit or miss from a fashion standpoint. If you like this look, the lacing will stand out in nicely either the Orchid or Gold colorways. While the embroidery, removable AirGuard liner, and unique side lacing make this an ideal pick from Scorpion for spring/summer/fall, those who are looking to spend less of an investment for Summer weather only may prefer the Scorpion Verano Jacket instead.